Melissa Parkin's Blog: Shadowhunters Review: Demons, and Angels, and Hotties, Oh My! Shadowhunters Review: Demons, and Angels, and Hotties, Oh My! 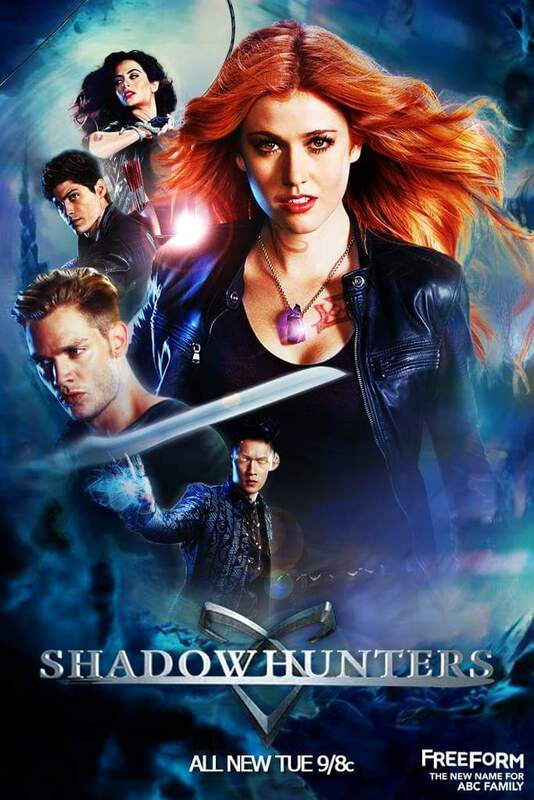 Adapted from Cassandra Clare’s worldwide best selling The Mortal Instruments book series comes FREEFORM’s attempt to cash in on the young adult fantasy craze with “Shadowhunters”. 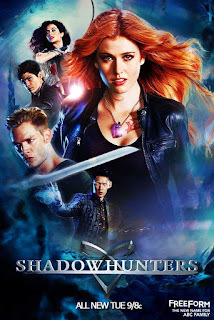 The story revolves around Clary Fray (Katherine McNamara), a New York City artist, who on her 18th birthday discovers the underbelly of an impossible world where vampires, werewolves, demons, and angelic hybrids all exist amongst humans. As it turns out, Clary’s run-of-the-mill mother, Jocelyn has been hiding her daughter from the past and the magical properties that come with said knowledge. Jocelyn was once a Shadowhunter, a member of an elite order of guardians who slay demons and protect mankind. After Clary quite literally runs into Jace (Dominic Sherwood), a gorgeous demon-hunting bad boy, she notices he’s quite taken aback when she confronts him. “You have the sight,” he mutters. Little does Clary know that this chance encounter results in a domino effect that forever changes her life. The Mortal Instruments is a sprawling urban fantasy world that rivals Harry Potter with its vast creature count, complex mythology, and universal laws. Shadowhunters are Nephilim offspring, which means they are of both human and angel decent. This dwindling race eradicates demons using powers granted to them by etching runes into their skin and weapons with Steles. Well, runes are magical symbols that give Shadowhunters abilities of all sorts, from speed to invisibility, and a stele is simply a blade made of the heavenly metal adamas used to draw them onto objects/flesh. And apparently, us muggles, or “mundanes” as we’re referred to here, shouldn’t be able to see Shadowhunters and Downworlders. They’re invisible to the human eye. Now, “What’s a Downworlder?” you ask. It’s pretty much every other class of creature that doesn’t possess angelic blood. Vampires, werewolves, warlocks, witches, faeries, you name it. Then there's the rogue Shadowhunter, Valentine Morgenstern, who kidnaps Clary’s mother in his quest to recover the Mortal Cup, one of the three divine items given by the patron angel Raziel to Jonathan Shadowhunter, the first Nephilim. The Cup possesses magical transformative properties that can turn mundanes (humans) into Shadowhunters, just by drinking from the goblet. Plus, Shadowhunters also save on time and transportation fees by using various portals, five-dimensional doors that can rapidly transport them all over the world. And the complexity doesn’t stop there, by any means, but you get the picture. Even over the course of a 585 page book, the introduction to this series, City of Bones, is a lot to digest for a reader. For a television viewer, the story is painfully convoluted when the creator crams half that material right into the 42-minute pilot episode. Fans took issue over the rushed world building in the 2013 silver screen adaptation The Mortal Instruments: City of Bones, yet Ed Decter doubled down on the critique when creating “Shadowhunters”. Setting aside the problem of pacing, plenty of other issues plague this TV newcomer. MTV’s new fantasy series The Shannara Chronicles delivers the goods on the CGI front, only emphasizing how weak the special effects are for “Shadowhunters”. The overall production lacks value. Despite Mortal Instruments: City of Bones not being a perfect movie, the film still nailed the aesthetic of the novel, especially the majestic gothic architecture of the New York Institute. In “Shadowhunters”, we’re introduced to some strange high-tech police department instead. Plus, the choreography isn’t filmed well. The weapons look like toy lightsabers. There’s a blatant lack of chemistry between the two leads. The majority of the acting is subpar at best, excluding the delightful Alberto Rosende. And the script generally falls flat, even becoming cringe-inducing at some points with its clunking and cheesy dialogue. Even the gorgeous faces and six-pack abs can't mask the flaws. What made the book series so special was not just the elaborate world, but the character complexities that drove each person. In “Shadowhunters”, everyone’s been whitewashed to clichés and stereotypes. For an avid reader and massive Cassandra Clare fan (such as myself), you most likely won’t appreciate this rendition. As for a newcomer to the intricate world of The Mortal Instruments, this televised version will most likely leave you scratching your head in confusion due to the inexhaustible information dump during the first two episodes. Is it possible that the Shadowhunting realm should remain only in print? For now, the odds sadly lean heavily in favor of yes.